This unusual project came about by a discovery in the attic. The client found century -old telegrams sent from Denmark to congratulate her grandparents on the occasion of their wedding in 1913. The grandparents were emigrants from the Denmark to the United States. 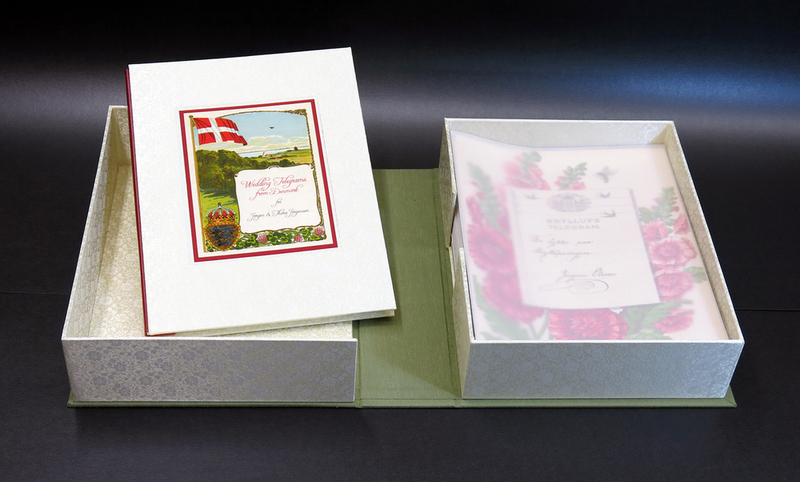 The congratulatory telegrams, a tradition in Denmark, were beautiful works of graphic art and were preserved perfectly. Lumino Editions created a custom clamshell box to house the thirty-six original pieces, each print was house in a folder of archival vellum and the box was made with luxury bookcloth imported from Japan. The box also housed a handbound one-of-a-kind book that told the story of the discovery and offered translations of each telegram. The entire production was a lovely gift to her niece who was married in the summer of 2014. This unusual project came about by a discovery in the attic. 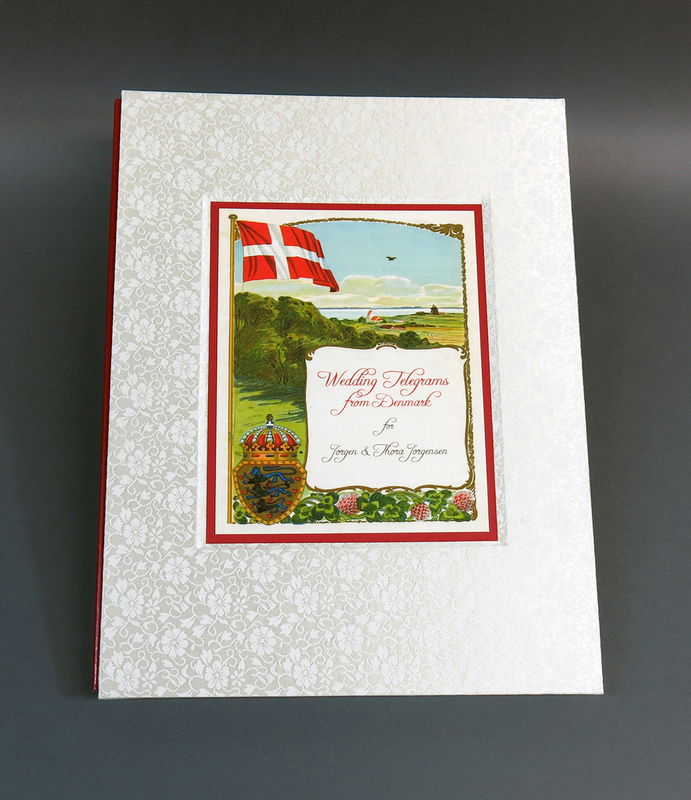 The client found century-old telegrams sent from Denmark to congratulate her grandparents on the occasion of their wedding in 1913. The grandparents were emigrants from Denmark to the United States. 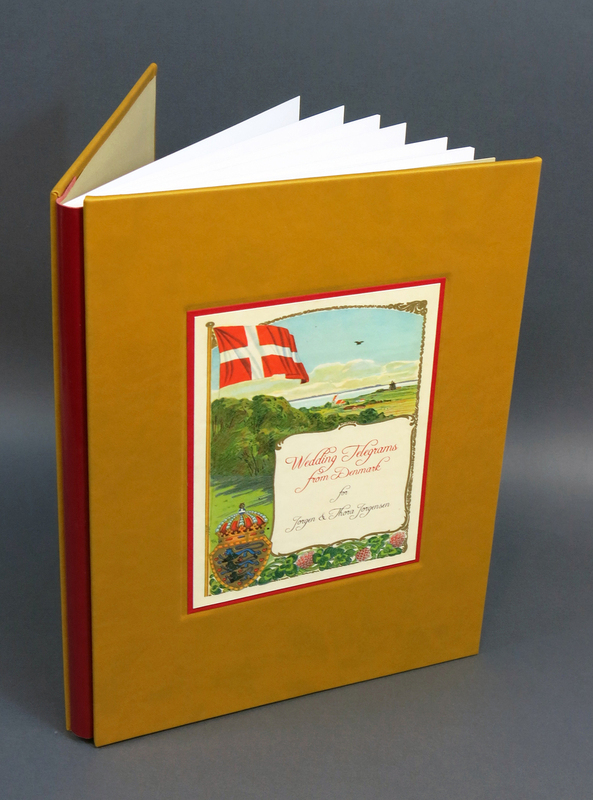 The congratulatory telegrams, a tradition in Denmark, are beautiful works of graphic art and were preserved perfectly. Lumino Editions created a custom clamshell box to house the thirty-six original pieces, each print was placed in a folder of archival vellum and the box was made with luxury bookcloth imported from Japan. The box also housed a handbound one-of-a-kind book that told the story of the discovery and offered translations of each telegram. In the bottom of the clamshell box is a "secret compartment" where the grandmother's original gold wedding band is kept. The entire production was a lovely gift to her niece who was married in the summer of 2014.